How did your Saturday go? For me, kind of boring! I don’t even know what I did, just a little bit of this and that. I did manage to get my workout in this morning, so I am happy to report I did strength training 3 times this week, and I did cardio for two, and I did do some walking during work. Every little bit helps. I am happy to say that on Facebook I asked Chris Freyteg about weight and why I’m gaining weight while exercising and eating within my calorie ranges, and she actually responded to me. Now I don’t know if it was her or her people who keep her FB page, but I was happy I got a response. This is the question and what she said. Me: Hi Chris, I have been working out 5 times a week, eating healthy 80% of the time and staying within 1500 calories a day! I keep gaining weight. I was maintaining for about a year and then boom, the weight started to come back! I am now 5lbs heavier since November. It’s so frustrating! Any advice? For workouts for the past 2 weeks, I have been using your extreme slim down. Chris: Hmmm – that seems strange…. Make sure your calories are correct… that is most people’s (including me) biggest miscalculation… or maybe after a year you now need more calories or different ones… when your body feels stagnant – best thing to do is make a change in your exercise routine and food choices!!! ALSO – could it be muscle? I don’t know you so I don’t know your routine …but I weigh like 15 lbs more than I did 15 years ago but still wear the same size…. I thought that was nice! It’s nice to get a response from someone of her stature. Ok, now for the good things! This is what I made for breakfast on Saturday and it was so dam good I couldn’t wait to share! Yah! That’s my Neapolitan Pancakes. Made with chocolate, strawberry and vanilla! Little Jenny said the pancakes tasted like a brownie. I thought this was amazing. 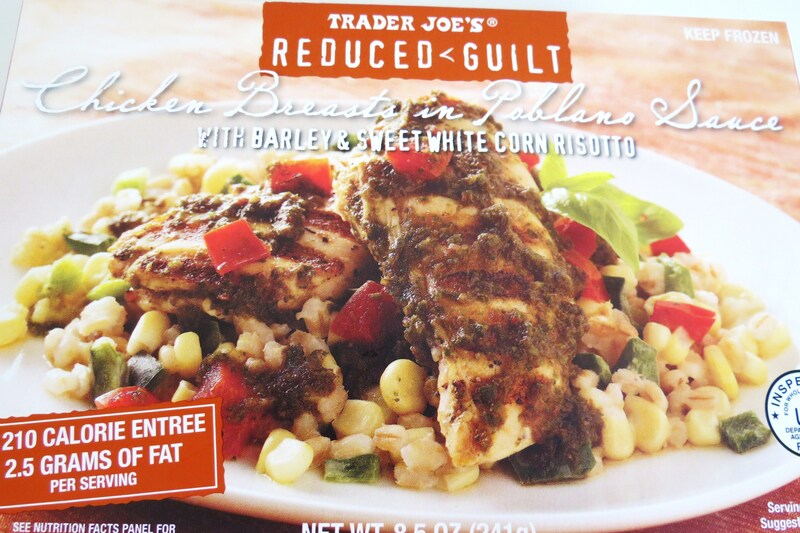 But before I get to that, I wanted to give you a review of a new item I tried from Trader Joe’s. It’s the Guilt Free Chicken Breasts with Poblano Sauce. I am normally not one for tv type dinners, but I saw the words Poblano and 210 calories, I just had to try it. This is what it looked like microwaved on my plate. It looks ok, but the portion is small. The chicken is, my guess, about 2 oz & 16 grams of protein. Two pieces of the chicken were kind of chewy, but the bigger one was good. I thought the flavor of the risotto was nice and I like the corn. I did have to add some Franks Hot Sauce to it, for added flavor, but I put that sh!t on everything (lol). I think this would be a good meal for lunch with a side salad, but it wasn’t enough for dinner. There is the option of cooking in the oven but it takes 30 minutes. If I have to wait 30 minutes, I might as well make a full piece of chicken with a side of rice. I rate this out of 5 stars, about 2.5 – 3. Would I buy this again? Maybe, when I’m in a pinch for a quick meal. 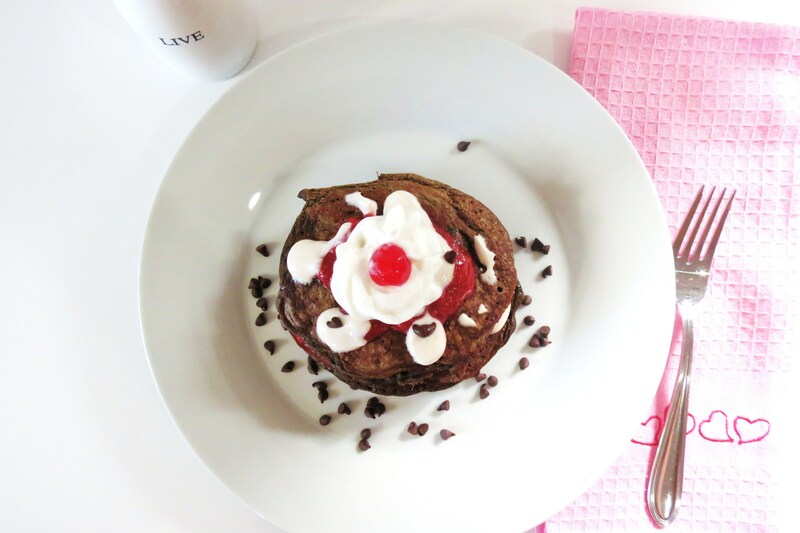 I adapted this from my whole wheat yogurt pancakes recipe. 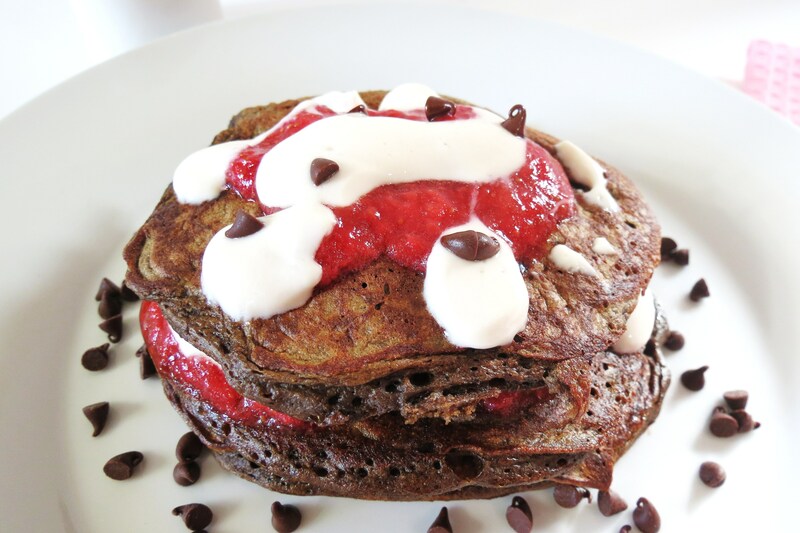 I used one 6 oz container of Chobani Vanilla Greek Yogurt for the pancakes and for the sauce on top. 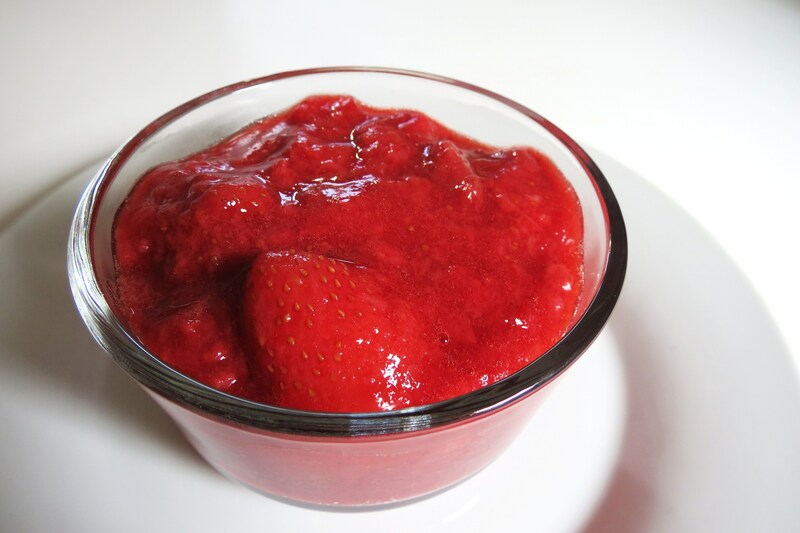 I also made a Strawberry Quick Jam, which I love. I wanted to give you the recipe for jam earlier, but I never got a chance. I make this all the time and use it for PB&J sandwiches, on my yogurt, ice cream, oatmeal, pancakes and more. I just love it!! 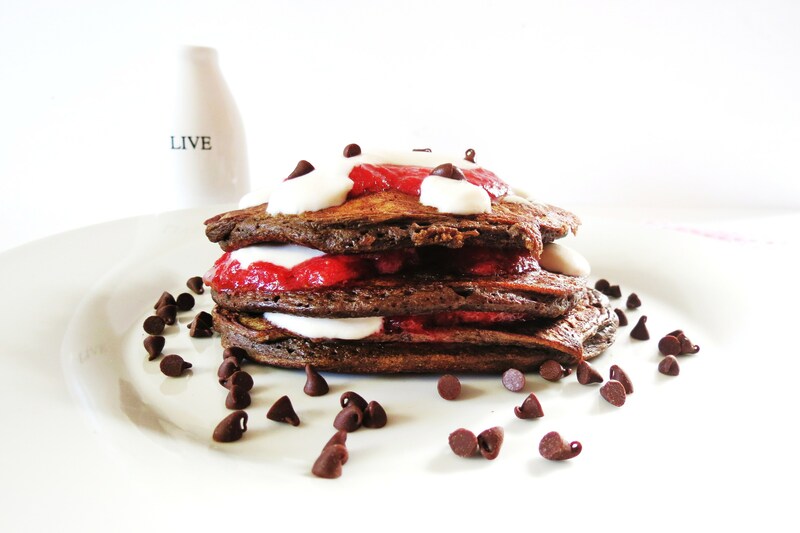 The pancakes are light, fluffy and taste of chocolate, but not to sweet for the morning. However they do taste of a brownie. I was actually pretty impressed on how they taste, because, he he, I tasted the batter, hey I was curious, it tasted gross! I thought I was heading on the 2nd weekend of pancake flops, but nope this one turned out very nice! It was actually perfect! Exactly what I was hoping for and the best part is it tasted goooooood and kept me full for hours. I didn’t even want to eat lunch! I really enjoyed the sauce on the pancakes. I took 3 tablespoons of Chobani Vanilla Greek yogurt and added 1 tablespoon of maple syrup. 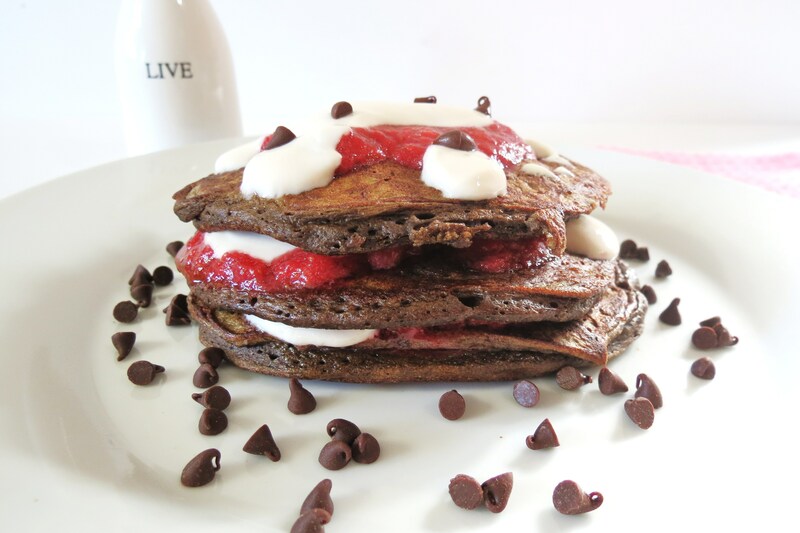 With the strawberries and sauce, there is no need for maple syrup on these babies!! I love that, less calories!! Put a plate in the freezer till cold and then have it ready to test your jam. In a large bowl crush your strawberries and then transfer to a large heavy skillet. Add the sugar and lemon. Turn heat to med – high and stir. After about 8 minutes test your jam, by placing a half a tsp on the cold plate. Wait a few seconds, if it is runny, then keep cooking your strawberries. Try again in another minute, you need to do this until the jam is in a jelly form. Once it is, your all done. Place the jam in a jar or glass bowl with a lid. Cool on the counter then store in the refrigerator. Make your own jam, it’s quick, easy and cheap! 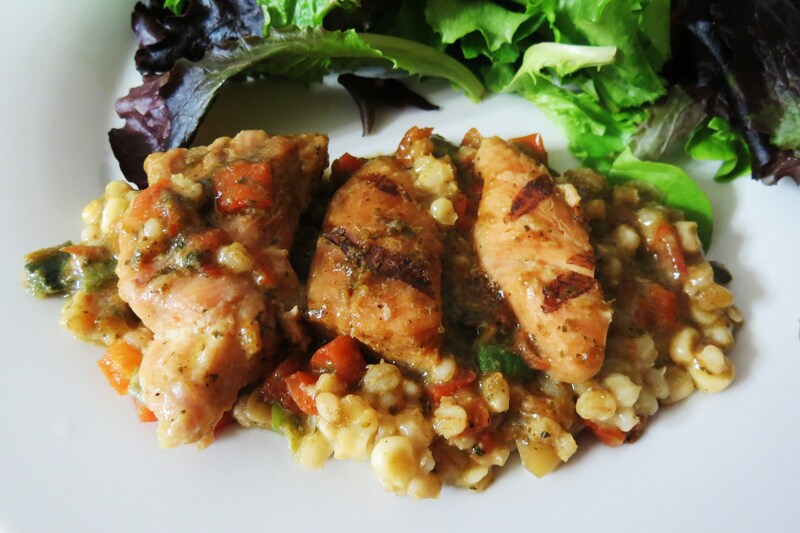 Look at the calories and this tastes way better than store-bought! I really love the Strawberry Jam! I usually by cases of strawberries in the summer and make this jam weekly. I also do this with other berries, like my Wild Berry Compote. I didn’t start my blog till the fall, so you’ll see this summer that I use a lot of berries, there my favorite!!! Combine flour mixture to the yogurt mixture and whisk till evenly mixed. 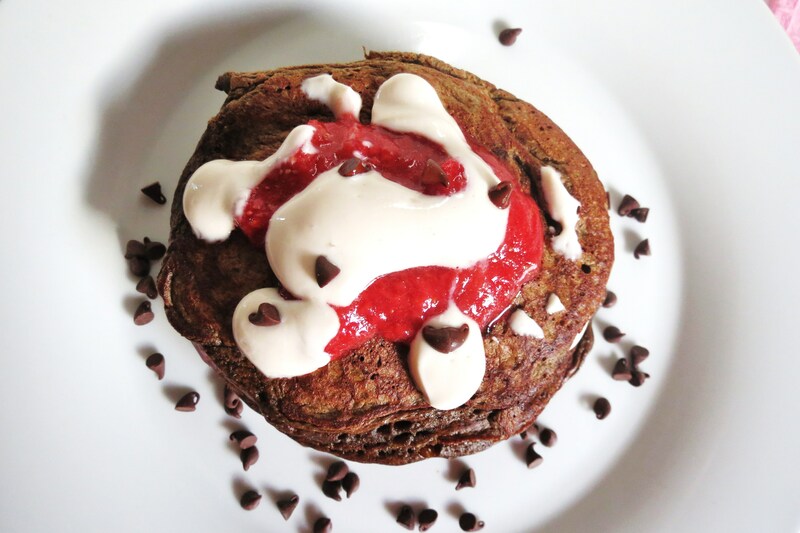 Spray a non-stick skillet with cooking spray and place 1/4-cup batter onto the skillet and drop a few pieces of the mini chocolate chips into the pancake batter and cook till bubbles start appearing through the top of the pancake and then flip. NOTE: Cook on medium heat and I flattened out my batter with the spatula to cook more evenly. Add yogurt and maple syrup in a small bowl and stir together until combined. 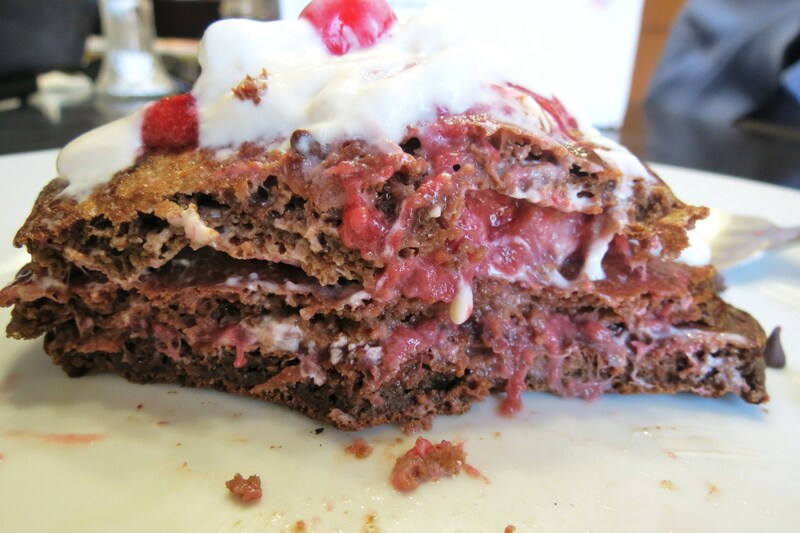 To assemble: On one pancake, I added about 2 tablespoons of strawberry jam and a little bit of the yogurt sauce, top with next pancake and repeat layers. For fun add some whip cream and a cherry on top! I am loving these pancakes. Funny I haven’t had pancakes in years, and then I tried a yogurt pancake at a restaurant this past summer and I was hooked! I knew I needed to create the recipe, and I did and now I keep creating more. I can’t wait to see what I create next. Pancakes are so fun and they do put a smile on your face. 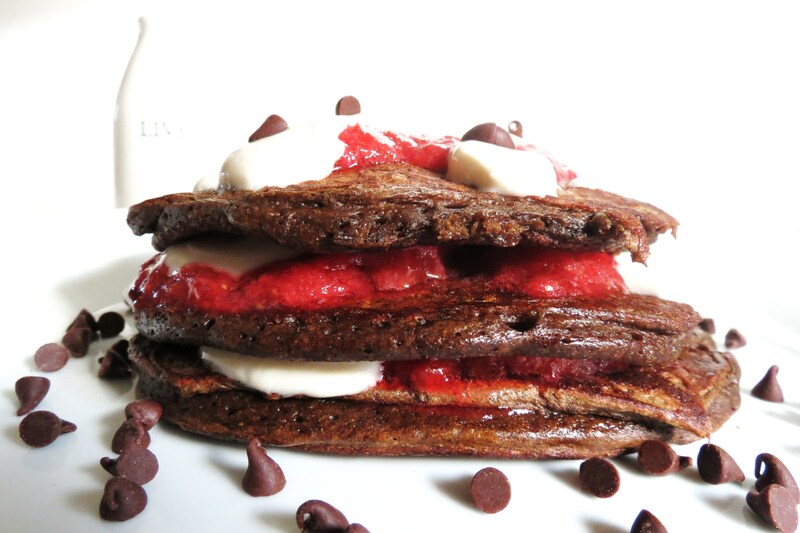 Now these pancakes don’t need anything extra to them, there perfect the way they are, but…. 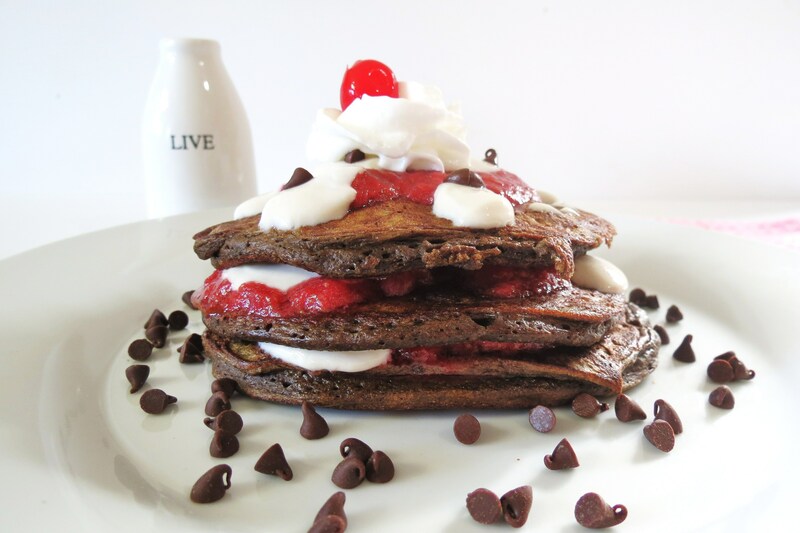 You know Neapolitan Ice Cream wouldn’t be the same without whip cream and a cherry, well Neapolitan Pancakes would like that love too!!! He he, they do make me happy!!! 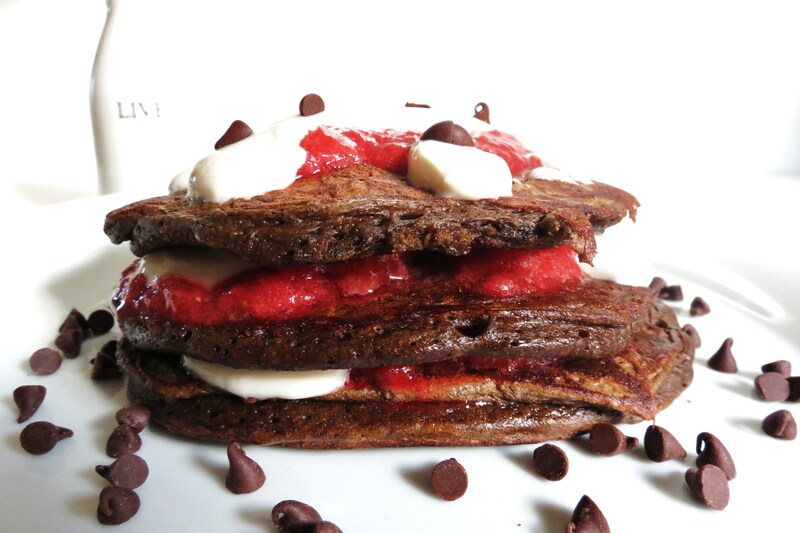 If you like chocolate, vanilla and strawberries, you must, must, must try this recipe! You won’t be disappointed! Just look at the inside!! Welp, it’s 8pm on a Saturday night, and I need to bake something, something I tell ya! So I am off! Have a wonderful weekend! Relax, stay warm and just enjoy your day, you know you deserve it, but be sure to make pancakes first! Oh, I updated my Trader Joe’s Page, so check it out!! Have a great day!!!! Thank you! Yes, I’ll take chocolate any time of the day!! Aaaaaaaagh those pancakes look sooooooooo delicious! I like the way you put the calorie content – thanks for that! Thanks!! I think it’s important to get an idea on what calories are before we eat something, so we don’t over indulge. 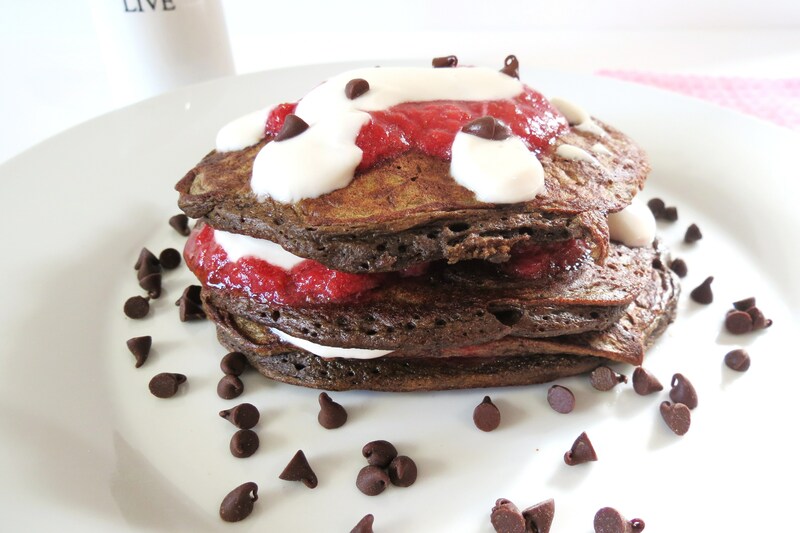 Made these this morning….delicious!! 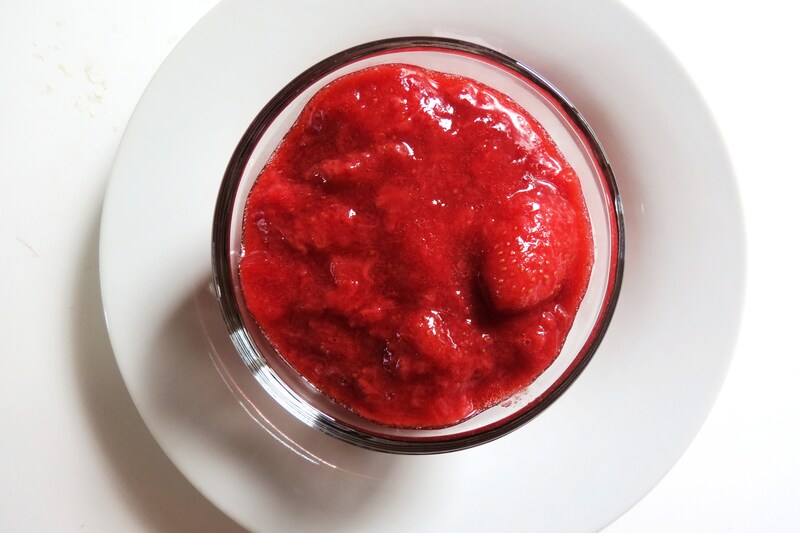 The strawberry quick jam was super easy and equally good. All of your recipes look so good thanks for the website! I am so glad you liked it!! It’s one of my top favorite pancakes! !